Roller skiing is an option to consider when there is no longer snow on the ground. This sport is similar to cross country skiing but uses skis that glide on wheels instead of those designed to glide on snow. The elongated skis have wheels on the ends to mimic the action of cross country skiing. Originally designed for cross country ski racers who needed to do off-season training, summer skiing has grown in popularity since more people want to keep in shape all year-long and continue to experience the benefits of cross country skiing. Made in America, V2 Roller Skis by Jenex are not only designed to give you the ultimate ski workout but also to keep your safety in mind. They have speed reducers and emergency brakes to help you control your speed when going down a grade, and allow for you to stop as needed. The inflatable wheels give you a cushioned ride and allow for skiing on both smooth surfaces and rough terrain. 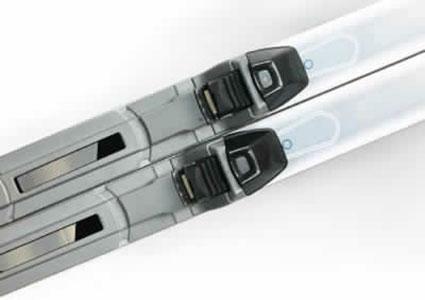 Combi: These skis are ideal to use on a variety of surfaces and can go over rougher terrain. The Aero XL 150SC are great to use on hills or mountainous terrain. Classic: These skis are perfect to use on bike paths, pavement and solid packed dirt roads. The classic XL 150RC give the user a smooth, solid ride and is a versatile option for all level skiers. Skate: These skis are designed for those looking to freestyle ski. The XLA850 feature full fenders and give the option to add brakes and speed reducers. You can purchase V2 roller skis at a variety of ski and sport shops across the United States. You can also purchase directly from the website or by calling 1-877-V2-Jenex. Most roller skis are in the $300 to $400 price range. Marwe rollerskis are exclusively distributed by Finn Sisu. This brand of ski is best known for its on-snow feel and is great for cross training in off-season months. Marwe skis are used by Nordic skiers worldwide and have become popular because they are durable yet affordable. Marwe Classic 700A: This rollerski is an entry-level ski and is priced under $300. It is easy to steer, has stiff control and will mimic the speed of snow skiing. 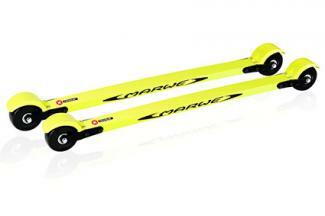 Marwe Skate 620XC: This rollerski is ideal for all-around training. The wheels have a superior grip and can be used in sand, debris and rougher terrain. It is priced under $400. Marwe has a retail outlet in Minnesota, but you can order online from anywhere in the United States and Canada. Swenor rollerskis are designed to feel as if you are training on snow. This Swedish brand was created for athletes in Sweden and Norway for training during the off season. Swenor skis are used by ski teams worldwide. Carbonfibre Classic Rollerski: This ski is a great choice for those looking for flexibility while skiing. It is designed for smaller skiers and features a smaller shaft and wheel diameter. This lightweight choice is under $300 and will give you the feeling of skiing on snow. Fibreglass Classic Rollerski: This durable pair of skis is lightweight yet durable. They can handle harsher road conditions and will provide smooth rolling and mimic the feel of skiing on snow. This style is also priced under $300. 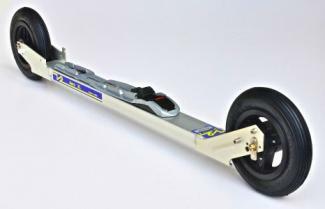 Swenor rollerskis are available at select retailers, and can be purchased online at Gear West. When planning on purchasing a set of summer cross country skis, there are several factors to consider. Skill level: A more advanced skier may look for a ski without a brake or speed reducer. Beginner skiers may want a stiffer ski that is easier to control. Terrain: A classic rollerski can go over smoother terrain whereas a skate or combo ski will give you the ability to ski on packed dirt, over debris and on rougher road conditions. Technique: A classic ski can be used to train or for recreation. A skate ski can be used to freestyle ski and to practice advanced skiing techniques. You may also want to consider your budget. Skis come in a variety of price ranges so if you are only going to use them occasionally, choose a pair that is more affordable. Those who plan on using the skis to train vigorously during the off season may want to invest in a more pricey option. Just like any other sports equipment, rollerskis need to be maintained properly. Before each use, you will want to check that your binding screws and wheel axel nuts are tightened. Loose components can cause injury during skiing. You will also want to check your wheels and replace them once they are damaged or aged. Keeping your summer skis in top shape will help them last longer and will provide you with many seasons of fun and conditioning.